A recent business intelligence report developed at the headquarters Transparency Market Research (TMR) has detected the market for tartaric acid is heavily dependent on the raw material suppliers of this organic acid. Being a seasonal acid that is extracted out of fruits including grapes and tamarind, the inflow of raw materials is limited to major manufacturers who cultivate their own or on contract. While there are tartaric acids, they are restricted from the usage across consumable product industries such as wine and food and beverages. The TMR report analyst has identified and profiled a number of prominent companies operating in the tartaric acid market, including as American Tartaric Products Inc., Caviro Distillerie S.R.L., Tarcol S.A., Distillerie Mazzari S.p.A., Giovanni Randi S.p.A., Derivados Vinicos S.A., The Tartaric Chemicals Corporation, Vinicas Inc., Omkar Speciality Chemicals Ltd., and Industria Chimica Valenzana S.p.A.
As per the projections of the TMR report, the global tartaric acid market will attain a value of US$3.16 billion by the end of 2022, with the demand expanding at a formidable CAGR of 6.2% during the forecast period of 2014 to 2022. Volume-wise, the global market is to produced a demand for nearly 80.2 kilo tons of tartaric acid in 2013, which was worth US$1.85 billion. The report has evaluated the potential of demand for tartaric acid that can be expected out of the end-use industries of food and beverages, wire, construction, pharmaceuticals, and others such as metal finishing, leather tanning, and chemical. Among these, the food and beverage industry is at the forefront, accounting for more than a quarter of the total demand as of 2013. The wine industry was other notable consumer, although this was mostly limited to western countries. 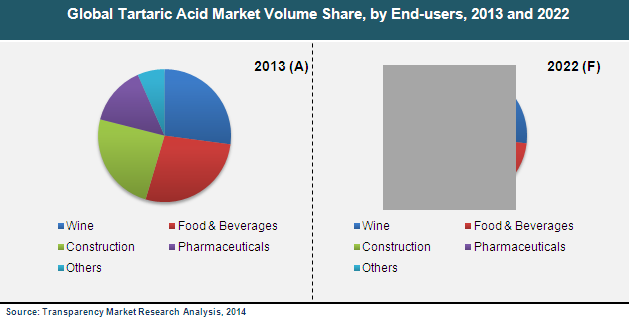 Geographically, Europe continues to be the most lucrative region for the tartaric acid market players, generating more than one third of the total demand as of 2013, that in terms of volume. The European region continues to dominate as a result of wire culture that has been prevalent for a number of decades. The food and beverage industry is doing quite okay in this region and end users of tartaric acid are generating demand from prospering countries such as Germany, France, the U.K., and Russia. In the coming years, the analyst of the report has foreseen regions with emerging countries such as China, India, Malaysia, and Thailand to generate profitable demands but not in great volumes.